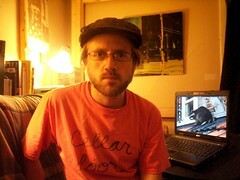 Over the past five years, I’ve been — very slowly and sparsely — writing and recording, without a project in mind. The release show of my last record, Between the Walls and the Sea, morphed into my band, Dalmatian Toadflax, which is on a lack-of-membership hiatus lately. To be honest, I just wanted to release something physical again. 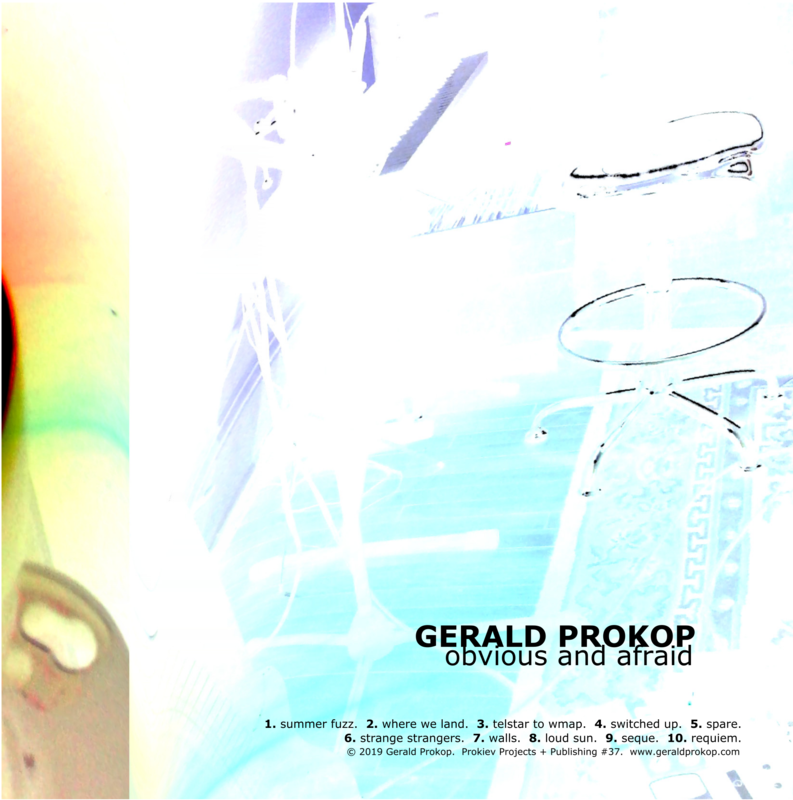 So ten scraps of disparate work from the last five years is becoming my next record: Obvious and Afraid. 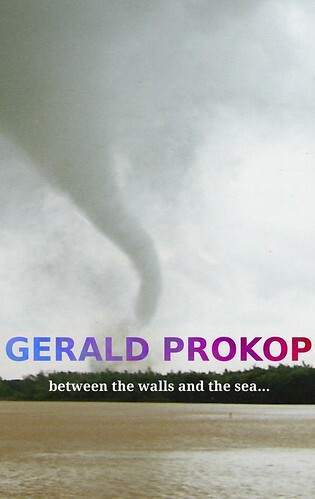 It’s likely that this record will go up on Bandcamp, sit there, and not progress beyond that. Will there be shows? Videos? 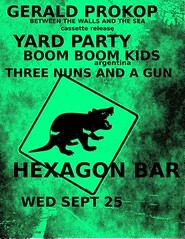 A cassette release? Who knows. I want to say that I’m just going to keep writing, recording and releasing stuff, regardless of any promotional potential or audience response. I want to, but it feels kinda pointless sometimes. All I know is that I’m not going to repeat the last five years. For my home recording rig, I use a 7×3′ desk (made out of an old door) to hold my audio interface and any instruments or effects I’m using - keyboards, pedals, mics, preamps, etc. I don’t like that real estate to be cluttered up with stuff that could live somewhere else. The computer, the speakers, lighting and monitors should ideally be sitting somewhere other than the desk. 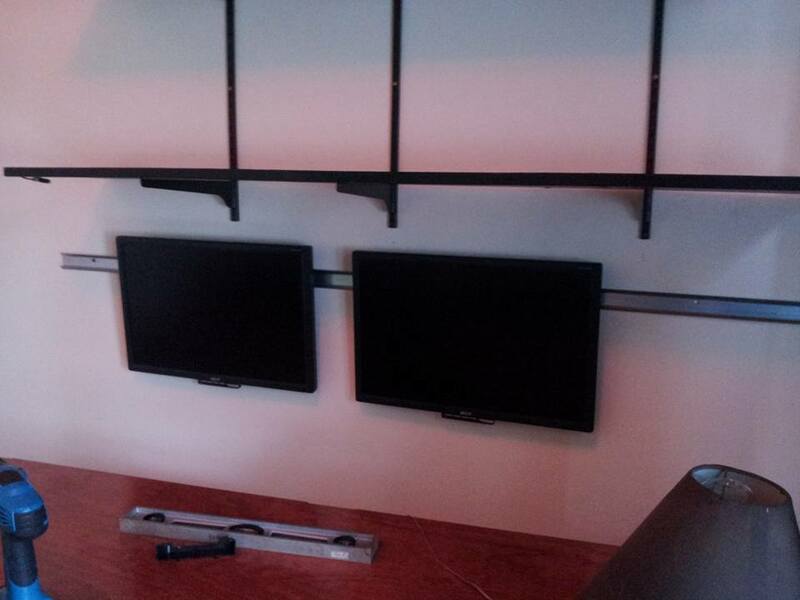 At my last place, I solved the problem by attaching picture hanger D-rings to the backs of my monitors and hanging them from drywall screws. That meant having a big ugly piece of wood spanning at least two studs, and lots of room for error when it came to making things level and straight. So here’s my new method. It cost about $10, looks a lot nicer and is a lot easier to get things hung straight. It’s all based on this stuff I found at Menard’s. 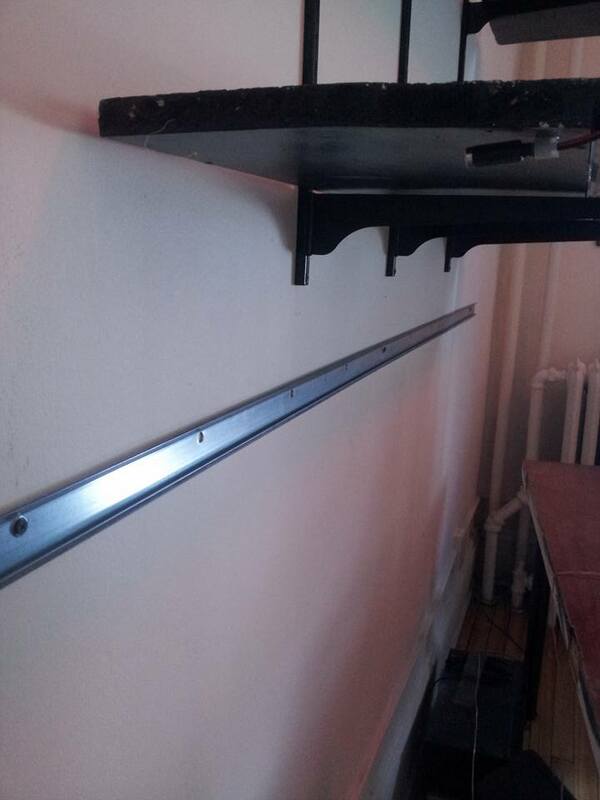 It’s a rail used for hanging garage shelving. 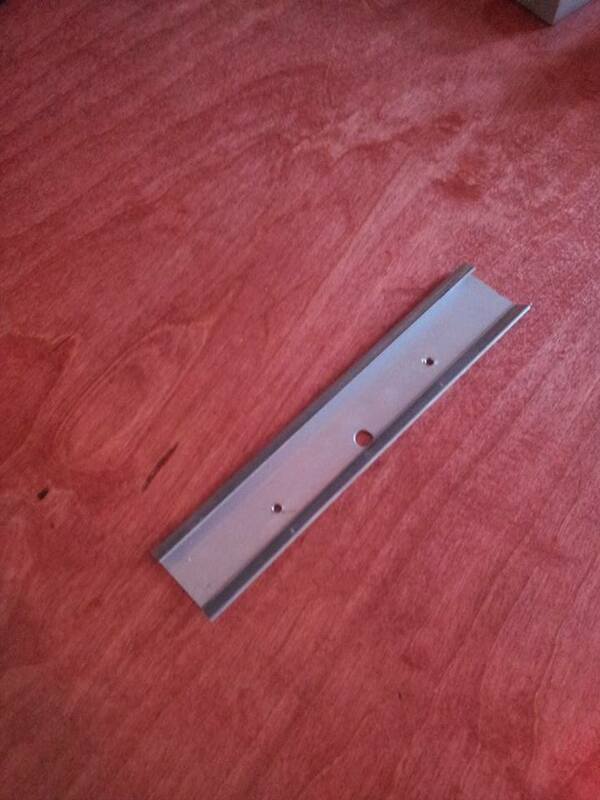 It’s steel and it already has holes every 8″ which should line up with the studs in most walls. 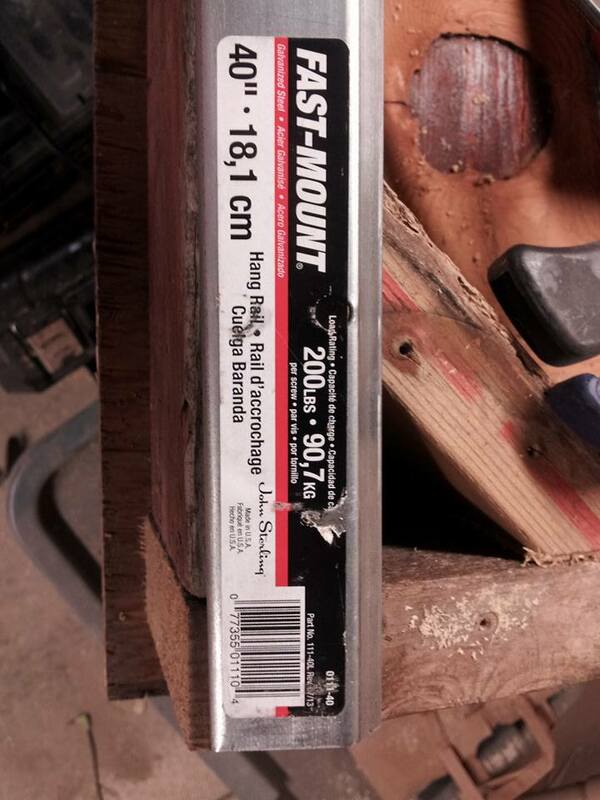 I bought one 7′ piece for hanging on the wall and a smaller 40″ piece to cut up and attach to the monitors. 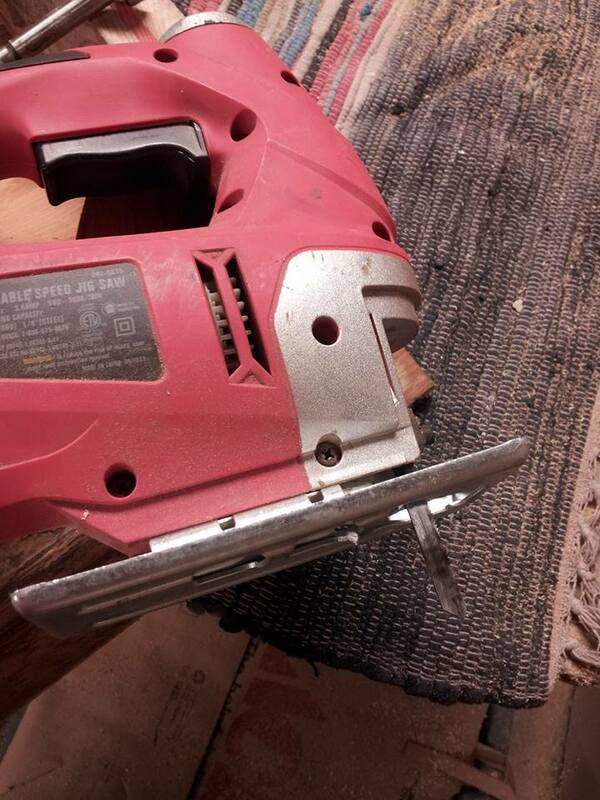 To cut the stuff, I used a jigsaw with a fine-tooth metal cutting blade. 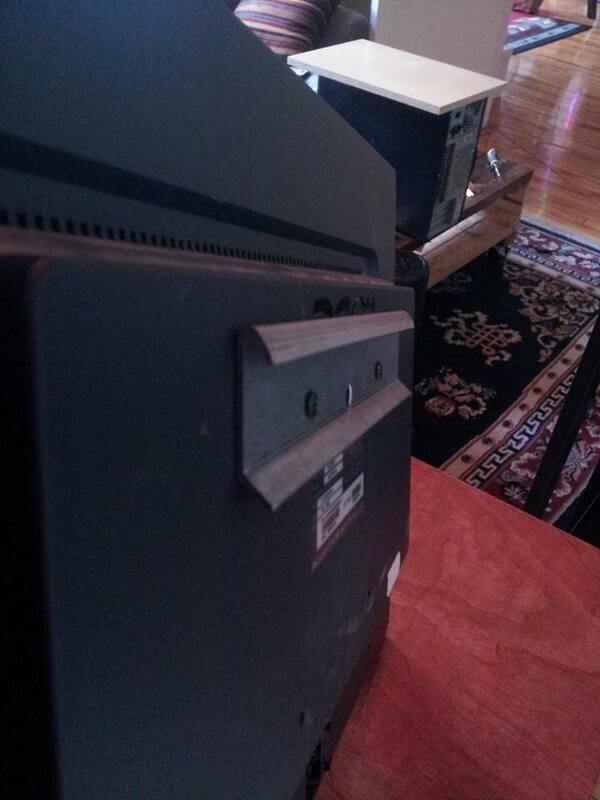 I also used a drill press and a step bit to drill the holes for the bolts that go into the back of the monitors. 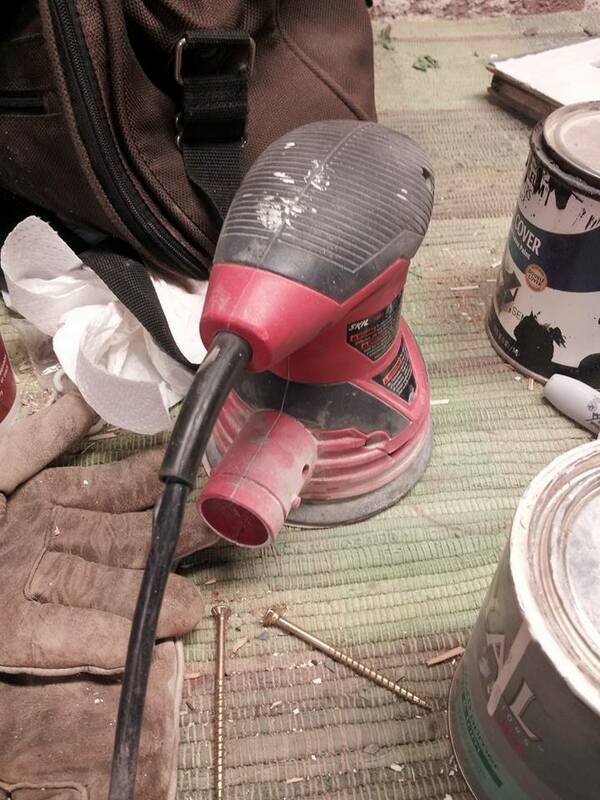 An orbital sander with a 60 or 80 grit disk is handy for removing the burrs so the screws fit tighter. I cut the smaller rail into 8″ chunks, and drilled two holes 10cm apart, which will line up with the mounting holes on the backs of my monitors. 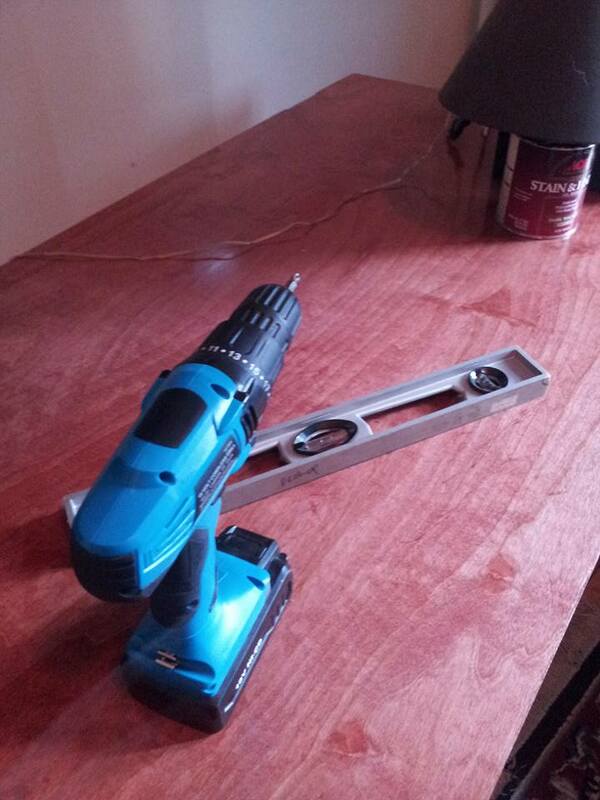 To hang the long rail — a drill, a level, some long drywall screws and some washers. I used three screws, figuring the material is strong enough. The idea behind using such a long piece is that I can slide the monitors anywhere along the rail. 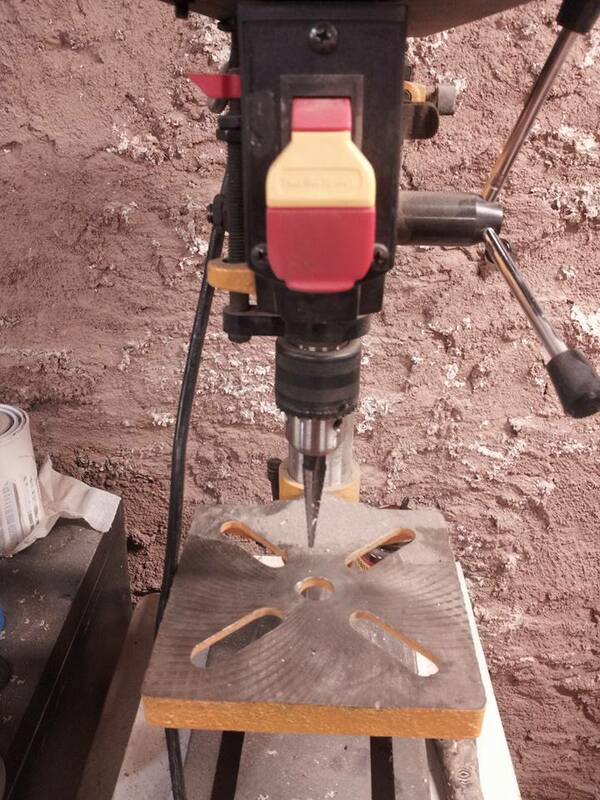 The center screw is going into a known stud. The other two I didn’t check because it’s a plaster and lath wall and the wood lath should hold it well enough. 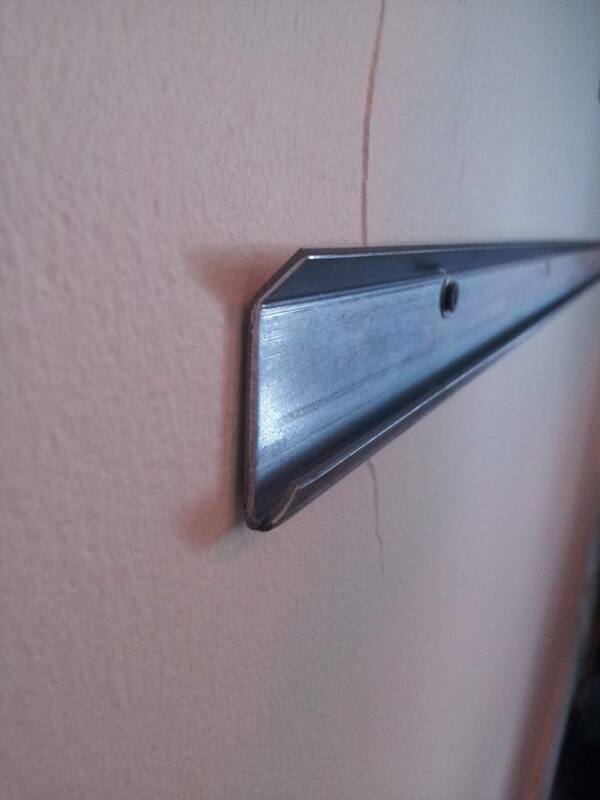 Going into drywall you may either want to be sure there’s a stud or use some heavy-duty anchors. Detail of the wall rail. The brackets on the monitors are the same material but upside down. You can see how they will interlock that way. 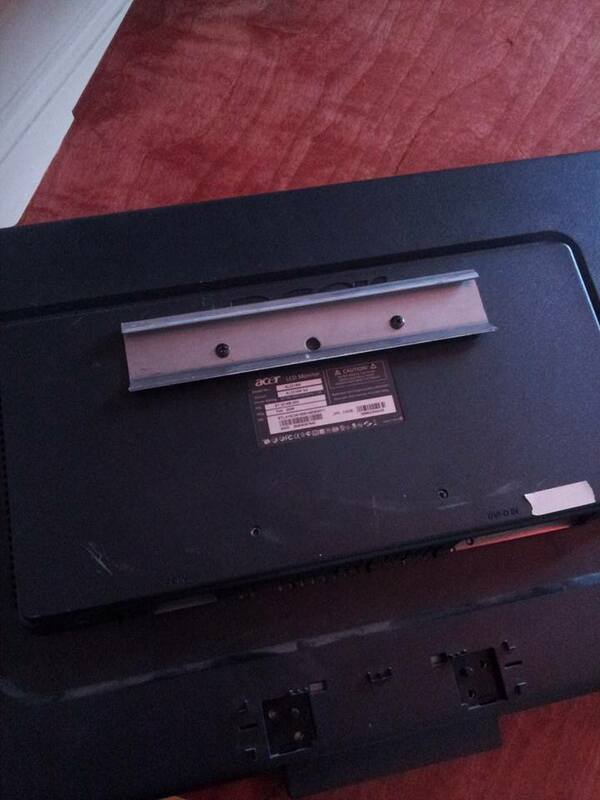 The back of the monitor without the bracket. I’m using just the top two holes. 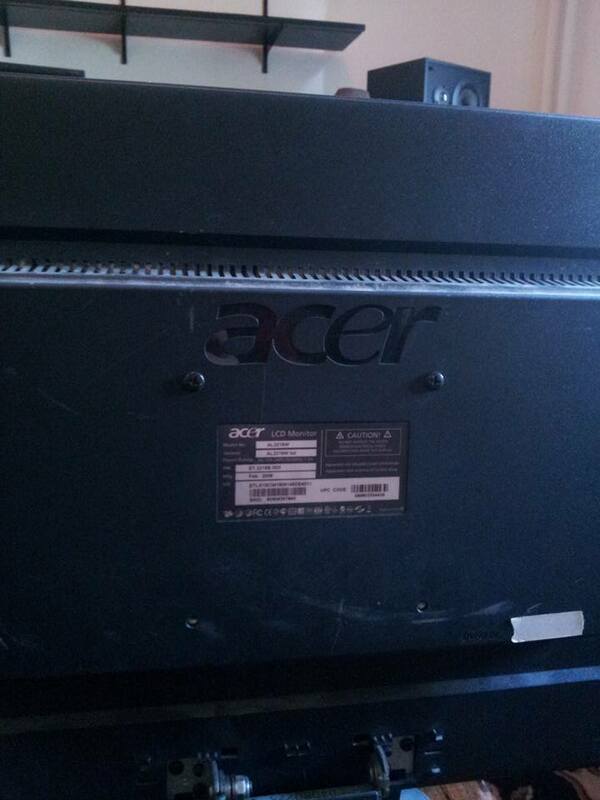 Back of monitor with bracket installed. Detail of the bracket. The top of the bracket will click into the bottom of the rail. And here’s everything hooked up and powered on. 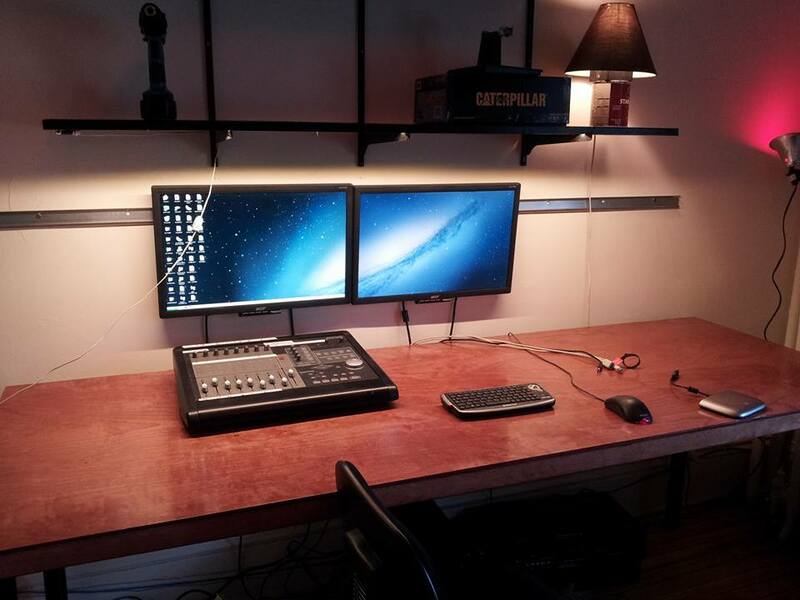 Now, if I want to set up synths or mics on my big table and need to move the monitors down, I can. I can also make pegboard panels that hang the same way to store cables and stuff. And no more wasting space on the table with monitor stands. 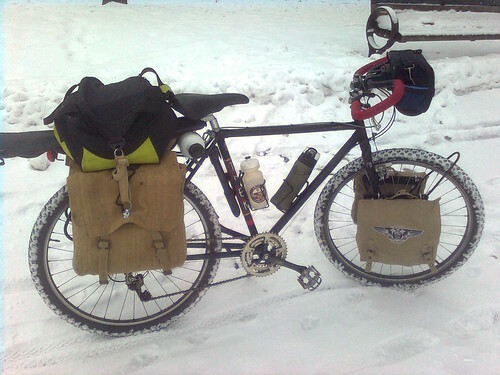 I’m a big fan of bicycle touring pack lists. In the morning I leave for just three days, to volunteer for a DNR project planting native plugs by Lake Volney in Le Center, MN. So on a whim, I threw together this pack list. Everything is listed as it’s unpacked. 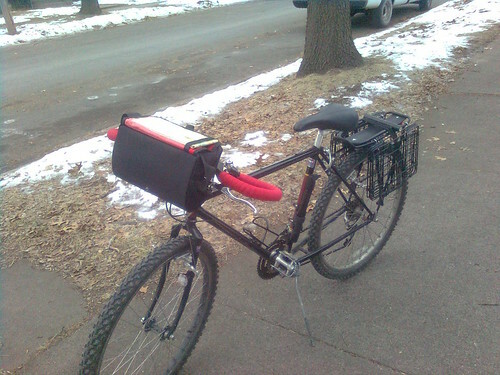 This winter I got my Trek 850 all fixed up for proper touring. 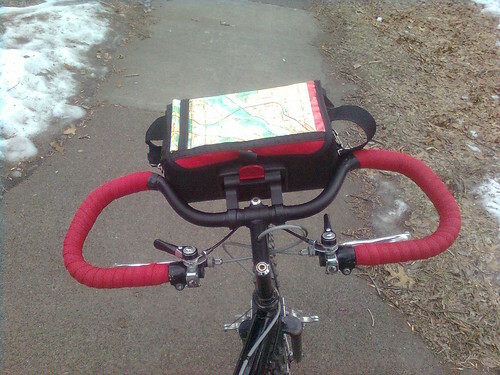 I made panniers, got a front rack and switched over to butterfly handlebars. It’s a big leap from last year’s setup where everything was piled on top of the rear rack. 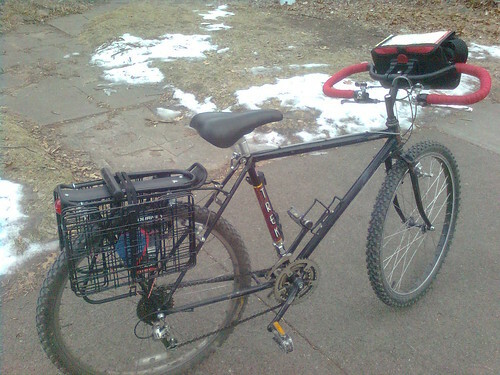 The bike was hard to mount and dismount and I couldn’t stand up to pedal uphill. Now I can even ride no-handed and it feels like a normal bike even with 40 pounds of gear hanging on it. This trip came together just in the last 24 hours, since I found out they were looking for volunteers for this project. It’s only 3 days, so my list is not quite typical. Gym bag containing extra water, plastic bags, all my food and some gardening tools. Toiletry kit with bug balm, sunscreen, Dr. Bronner’s soap, deoderant, toilet paper, first aid kit, hand lotion, pills, vaseline, a marker, alcohol wipes, toothpaste, toothbrush, nail clippers, razor handle and blades, and a comb. Swim kit with sandals, swimsuit and a camp towel in a cloth drawstring backpack (which is useful for hikes as well). Waterproof bag containing a blank notebook, a book on Environmental Literacy I’m reading, a bird fieldguide and a wildflower fieldguide. Ziploc of several bandanas, socks and underwear, as well as a hat. My DIY nested cook kit with an enameled steel mug, pot support, windscreen made out of duct pipe, stove made out of a beer can and a travel size french press. There’s also a small scotchbrite pad for cleaning. In one small pocket I have a ziploc containing 6 firestarters made out of cotton balls and petroleum jelly. In the other small pocket I have a travel can opener. And one large ziploc I call the “coffee can:” miscellaneous tools and hardware–spare bolts, tire levers, a presta valve converter, batteries, matches, patch kit, caribiners, etc. In the small pocket, i keep a bicycle multi-tool. Sunglasses (or glasses — whichever I’m not wearing) in a case. Apple Fritter bread for breakfast. I also have my silverware in here rather than with the cookset since most of the time I won’t be cooking.